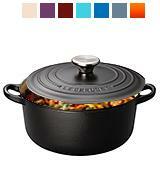 Large ergonomic handles and tight lid along with enamel black interior make Le Creuset dutch oven a perfect choice for cooking mouth-watering healthy dishes. This Dutch oven is somewhat pricey. 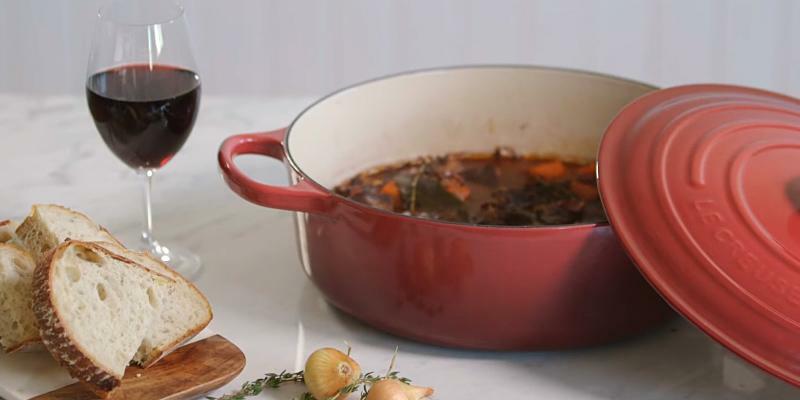 Boasting a classic design, this dutch oven is ideal for cooking the most delicious meals for your family or friends (its capacity is enough for 6-8 portions). Thanks to a vast colour range, you can select the model to suit your interior. Dimples on the lid make the evaporated moisture drip back into the pot, which helps preserve flavours and allows cooking tender succulent meals. 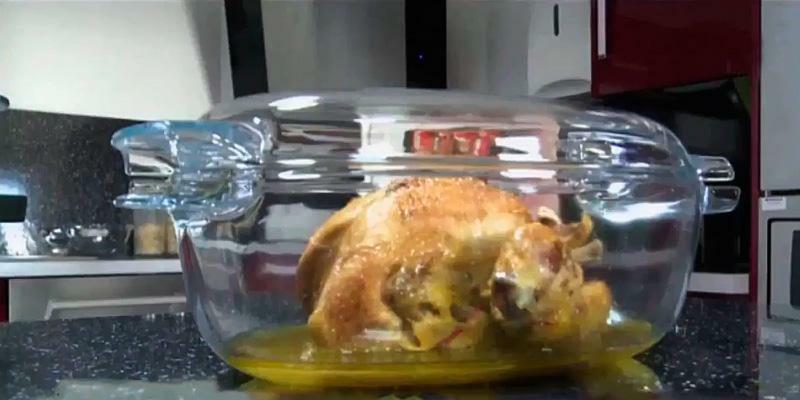 The lid knob might get too hot if used in the oven. If you are looking for a high-quality Dutch oven compatible with any cooking surface, Andrew James casserole dish is exactly what you need! A wonderful choice for a family of 4-6 people. 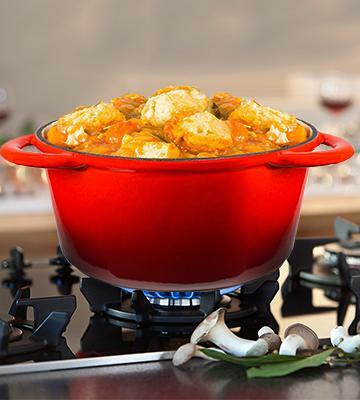 Having bought this marvellous Dutch oven, you'll get a two-in-one appliance: a casserole for cooking a variety of dishes and a skillet for roasting meat or stewing vegetables. To prevent rusting, you should wipe it dry after each cleaning. Since this Dutch oven comes preseasoned, you can use it right out-of-the-box. The casserole has ample capacity to cook a meal for 4-6 people, let alone the lid! You can also buy this Duch oven with two scrapers included. Made from high thermal shock-resistant borosilicate glass, Pyrex oval casserole can be used on a cooker and placed in a fridge for storing. You can't use it on a hob. 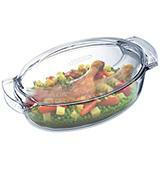 Being well resistant to high temperatures Pyrex casserole allows experimenting with many meals cooked in the oven. The ergonomic lid can be used as an extra cookware. A thoughtful design (3.5mm aluminium housing) works for even heat distribution. At the same time, this casserole is fairly lightweight compared to its competitors. 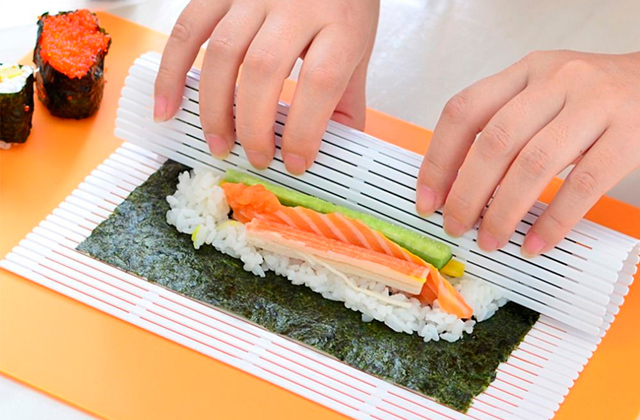 It may be not so easy to store because of its high lid handle. A decent choice for a family of 5-7 people. This super easy-to-use casserole has handy silicone stay-cool grips and a double layer non-stick coating for excellent cooking results and hustle-free washing up. Traditional Dutch ovens are made of cast iron, and this model is no exception. Its thick pot walls allow roasting and baking a variety of mouth-watering dishes. In addition to these marvellous features, Le Creuset casserole boasts an advanced design that makes it incredibly simple to use and maintain. 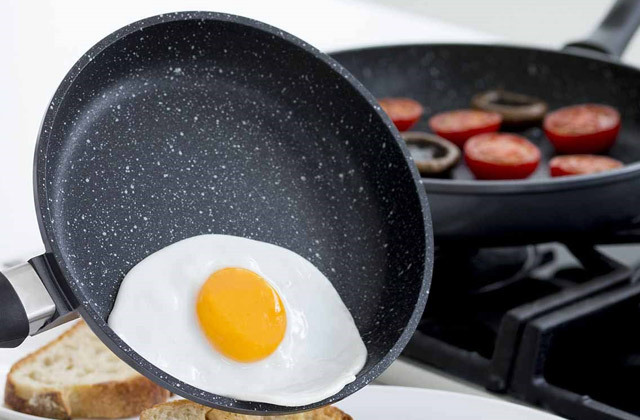 A black colour of its toughened enamel interior allows faster cooking and hustle-free hand washing or dishwasher cleaning. 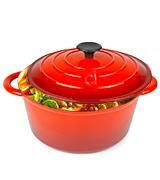 Besides, the casserole comes with an improved cast-iron tight-fitting lid. All these work for an excellent heat distribution and lower power consumption. What is more, this Dutch oven has ergonomic easy-grip handles for comfortable carrying even when wearing oven gloves. 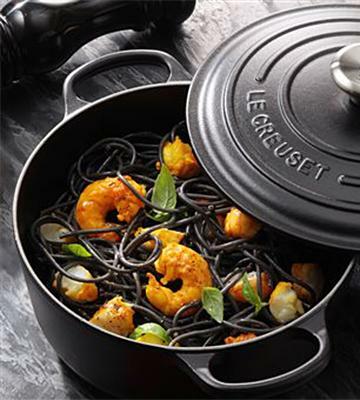 To sum up, this marvellous Le Creuset roasting dish is the best choice for both novice and seasoned cooks. If you are looking for a high-quality appliance for cooking flawless, tasty and fluffy rice, you will find it here. If you are looking for a model with outstanding usability, this Andrew James casserole dish is the one to choose! You can use this versatile Dutch oven pot on literally any cooking surface, including ceramic, induction, halogen, and Aga/Rayburn cookers. Invented by a Nobel Prize-winning physicist more than 80 years ago, AGA cooker is widely used and appreciated all over the country. Made of cast iron, it evenly distributes accumulated heat that helps preserve flavours and nutrient value of cooked meals. One more way to cook incredibly delicious, succulent, and healthy meals is to use Andrew James casserole dish. Thanks to the used material (cast iron) this Dutch oven allows even heat distribution and excellent temperature retention. There is one more little secret of preserving food's flavours and juices: special nodules on the lid's underside. They make the evaporated liquid flow back to the pot, this way preventing your meals from drying out. This wonderful Dutch oven is enough for cooking for a family of 4-6 people. Nothing compares to an electric griddle when cooking grilled veggies and barbeque. 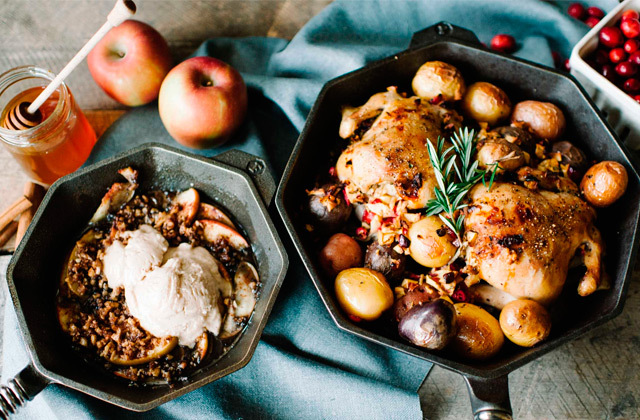 If you want your cast-iron casserole to serve you for years, proper maintenance is essential. Most Dutch ovens have a similar design and functionality. However, there are some useful improvements in particular models. 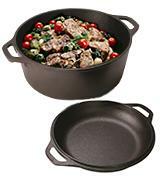 If you are looking for a super comfortable and versatile cookware, consider this Lodge Dutch Oven. First of all, the item is pre-seasoned, and you can use it right after you unpack it. This casserole is made to last; if well maintained and regularly seasoned, it will serve you, your children, and even your grandchildren! One more useful feature: this Dutch oven pot has an ergonomic lid that converts into a skillet. In such a way, you get two irreplaceable cookware pieces instead of one. 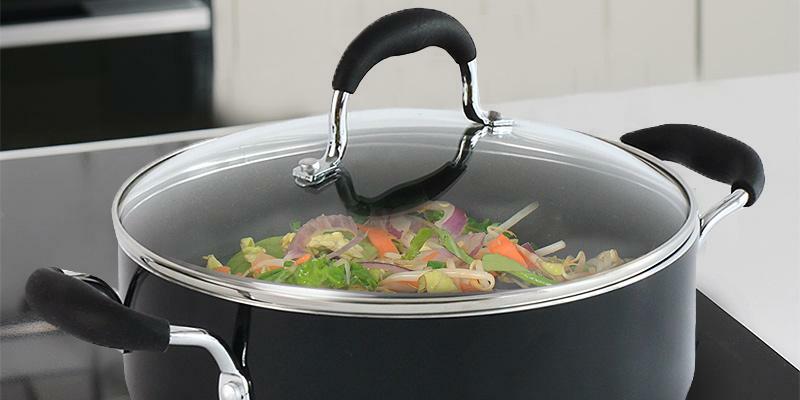 The pot is perfect for stews, soups, and even bread baking, while the lid/skillet can be used for frying vegetables, and more. 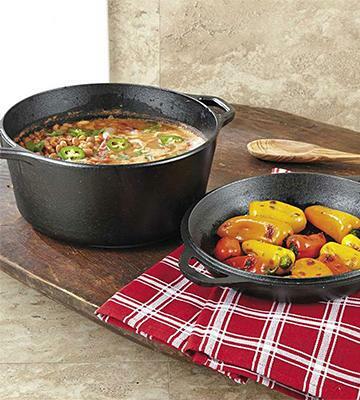 There are so many healthy and delicious dishes to cook in this Lodge Dutch oven! For a hustle-free maintenance, you can opt for the same casserole but with two scrapers included. 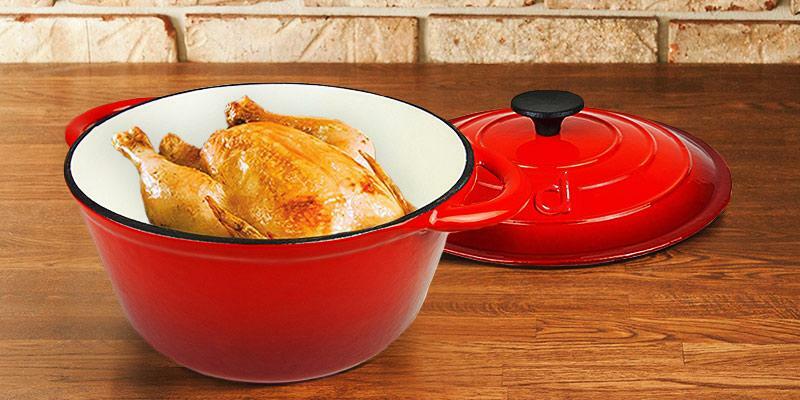 If you want your Dutch oven to serve you for ages, it is advisable to use silicone cooking utensils to prevent casseroles from scratching and damaging. 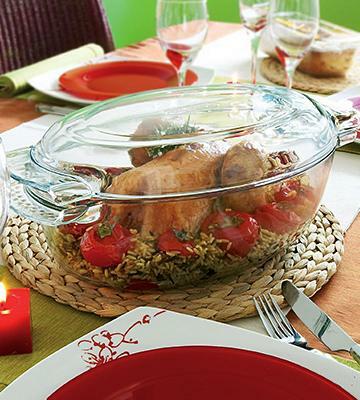 Pyrex Glass Oval Casserole has a stay-of-the-art design, different to that of conventional Dutch ovens. The item can't be used on a hob. 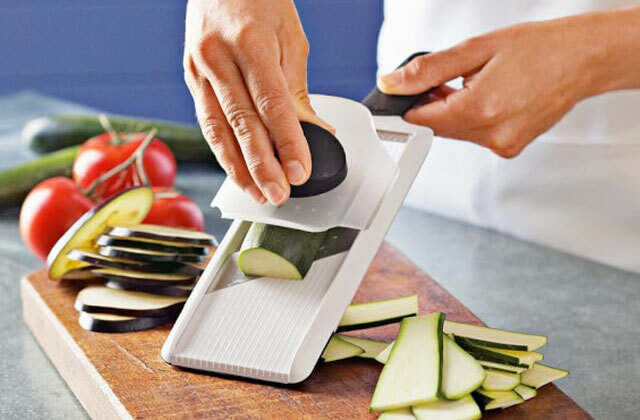 However, it has many other outstanding features that make it an essential cookware in any household. 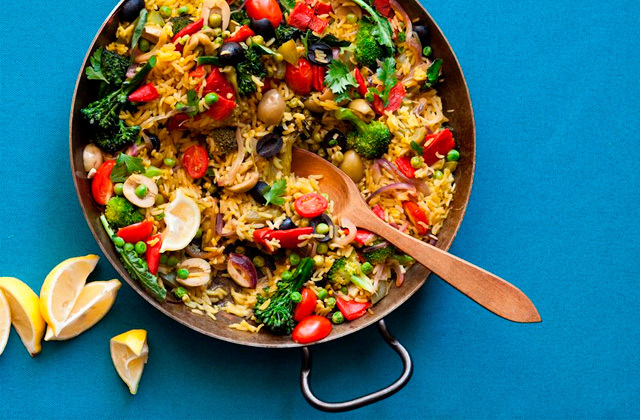 We are talking about cooking variable dishes in an oven and serving them in the same casserole for most convenient use, savoury flavours, and mouth-watering look. The Dutch oven is large enough for cooking 4-6 portions at a time, and if you haven't finished them, you can put the casserole into the fridge for storage. Then again, you can warm it in your microwave in this multifunctional cookware! By the way, if you are looking for a high-quality microwave oven, you can find it here. And there is also a versatile lid/dish that you can use for cooking, serving, storage, and warming! What else could you wish for? The lid provides sufficient capacity for cooking for a couple, for example, a romantic dinner for you and your significant other. All in all, a Pyrex Glass oval casserole can hardly be overestimated! What makes ProCook Gourmet shallow casserole an excellent choice for any housekeeper? First of all, its aluminium pot has a reliable double layer coating. It will help to prevent any burning or sticking while cooking your favourite meals and ensure easy cleaning of the pot. 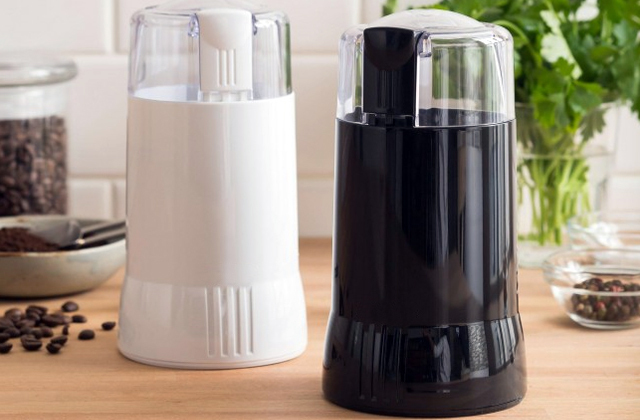 What is more, this model has ergonomic silicone handles for a comfortable and safe use, and a glass lid to control cooking. 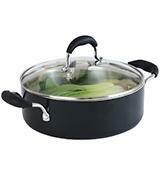 This Dutch oven has ample capacity for 6-7 portions; if you need a smaller one, there is also a 3.4 L item. There are never too many pots and pans. 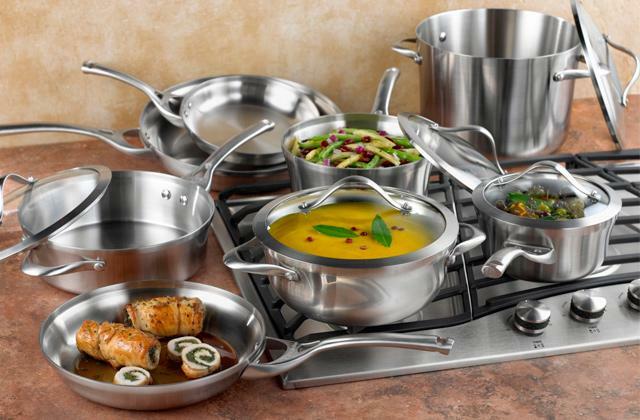 For the most convenient cooking, we recommend you get on of these fantastic sets. You may also be interested in our cutting boards review. Today Dutch ovens are widely used and highly appreciated all over the world. A Dusch oven is a heavy-duty, deep pot, oftentimes crafted of cast-iron, which is mainly aimed for slow cooking and stewing. Yet, it's also used for cooking various sauces, soups and baking. 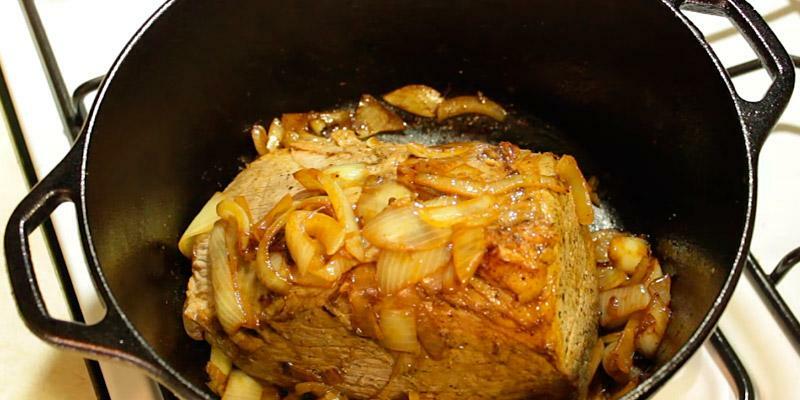 With a Dutch oven, you will have your meals as flavourful and succulent as if they were cooked in the oven. 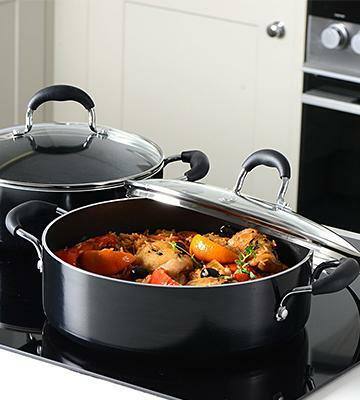 This pot will not only let you experiment with your favourite oven recipes but also cook them all on the stove instead. If you haven't happened to have a Dutch oven yet, it's high time to purchase one now. In our review, you'll find only the best Dutch ovens on sale, so it's going to be easy to make the right choice. If you are looking for a kitchen appliance for an extra-fast cooking, consider buying one of these wonderful pressure cookers, and if you want to have your dinner cooked while you are at work, a slow cooker is a perfect choice! The foremost thing to consider when looking for a Dutch oven is the Weight and Capacity of the chosen product. Most of the pots are rather heavy, which is hardly surprising bearing in mind their functionality and overall performance. In pursuit of the leading positions in the market, manufacturers make their best to produce more lightweight items to meet the needs of the wider audience, so you've got a broad variety to choose from. You should also pay attention to the capacity of the Dutch oven. If you're out of a big family, you'd better go with a bigger pot to not cook in several stages. A small Dutch oven will become a great addition to a 1-2 people household. 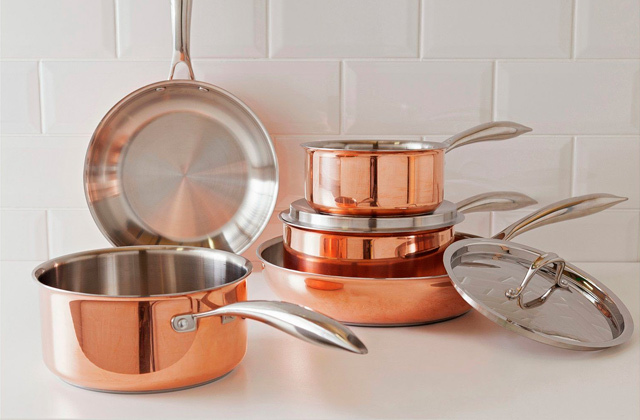 Cookware is often bought to blend with a particular kitchen interior. The Dutch ovens are not an exception and they've got their own Design too. 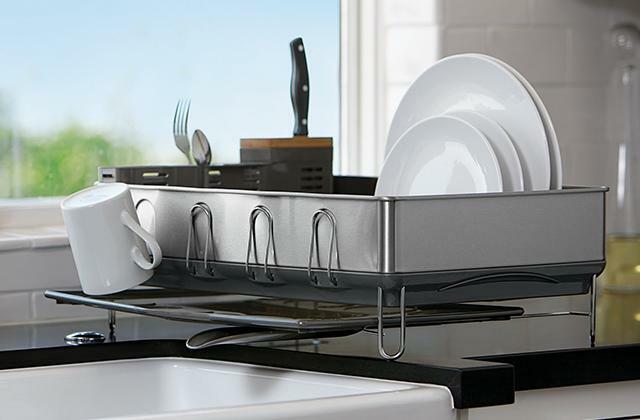 Available in different colours, they will naturally fit your countertop and stun with exclusive functionality. The material which the pot is made of determines its performance to the big extent. 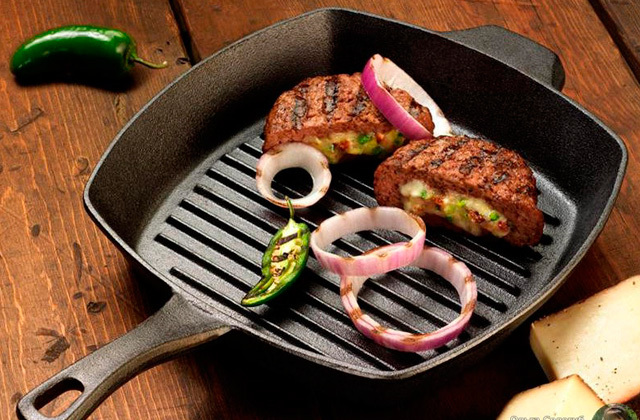 Most Dutch ovens today are made of high-quality cast-iron. Compared to stainless-steel pots, cast-iron Dutch ovens are considerably more lightweight and less expensive yet they handle the same cooking processes equally well. 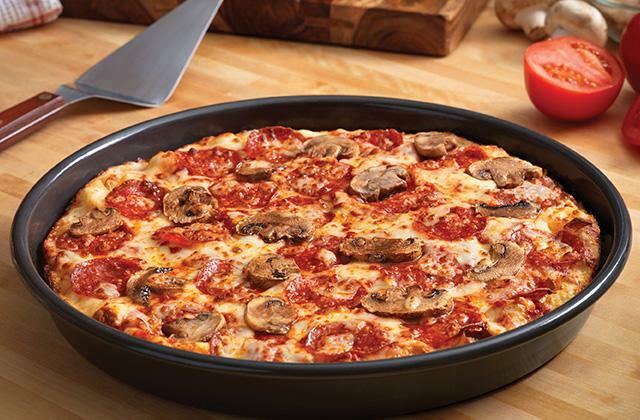 Thanks to a non-coating finish, it's also become easier to keep the diet not only tasty but also healthy, by adding just a little bit of oil. Consider how the lid looks like. It's quite important if it doesn't let the evaporated liquid escape through the holes, to preserve all fragrances and juices. We've also considered the Use and Care feature to let you decide whether this or that Dutch oven is going to work for you. Notwithstanding all pots have been made for use in the oven, you may want to find out the maximum temperature your chosen Dutch oven can handle. One more important tip is its compatibility with different types of stoves. In case you don't want to get disappointed later on after making a purchase, it's worth knowing peculiarities of various pots right from the start. Cleaning the Dutch oven is not usually great pleasure as most enamelled pots are not dishwasher safe. Yet, if you can't stand hand-washing, you may find your perfect pot that won't require your effort for clean-up at all. You're making the choice! 1. Lorna Hordos How to Choose a Dutch Oven, SFGate. 2. Tips for Buying a Dutch Oven, eBay. March 10, 2016. 3. Lisa Munniksma Choose the Best Dutch Oven for Your Needs, Hobby Farms. December 29, 2014. 4. Charles Kassotis Tips When Selecting a Dutch Oven, FoodEditorials. 5. Jessica Karley Rerick Going Dutch: Dutch-oven cooking is perfect for winter, INFORUM. January 22, 2016. 6. Dutch oven, Wikipedia. November 9, 2016. 7. 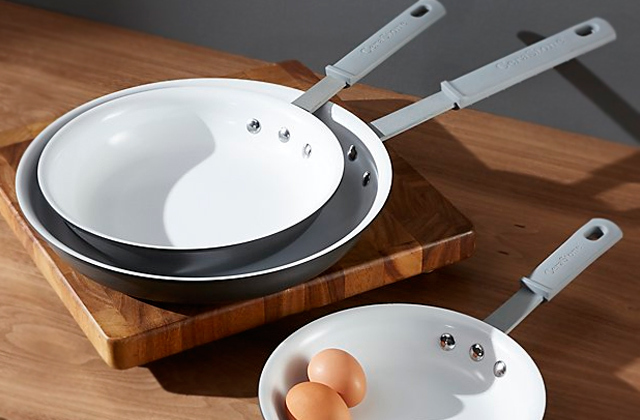 Cookware buying guide, John Lewis. 8. Dutch Ovens Buying Guide, BHG.